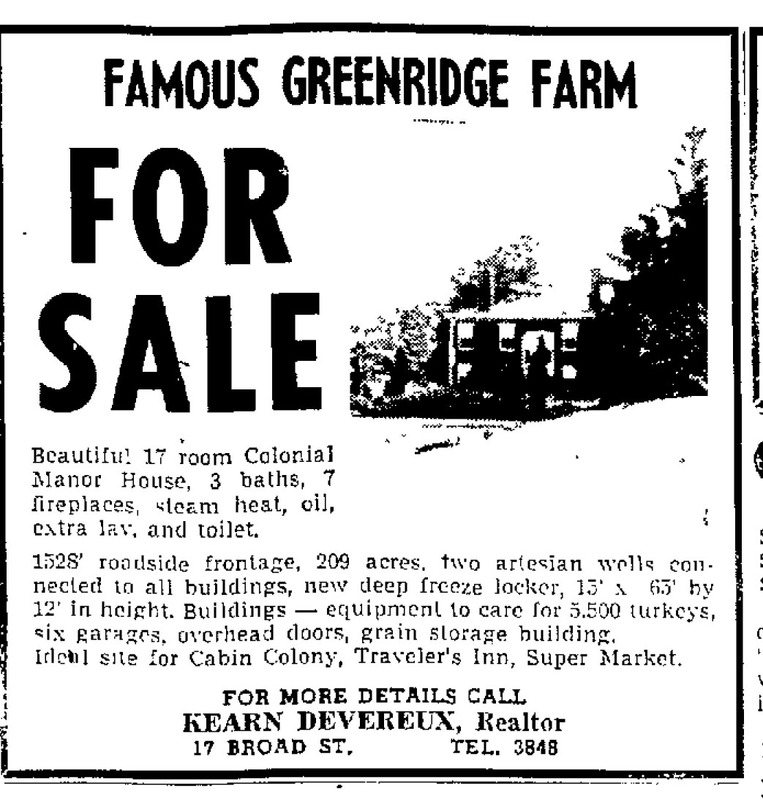 Do you remember Kimball’s Green Ridge Turkey Farm on Nashua’s Daniel Webster Highway? Who can forget the giant turkey that once stood atop that iconic sign on DW Highway? 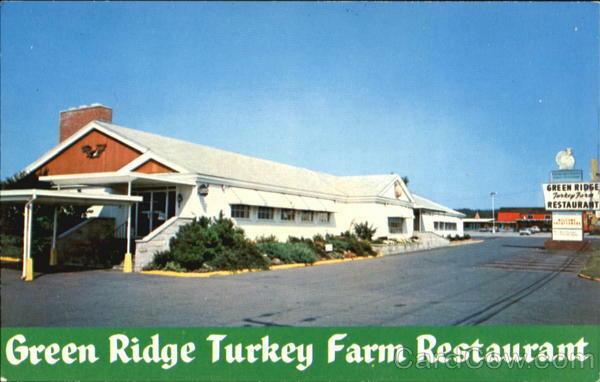 For nearly 60 years, the Green Ridge Turkey Farm stood on the corner of the DW Highway and Spit Brook Road in Nashua, NH, about two miles north of the state border with Massachusetts. Its site was historic – the main house of the farm, called the manor house, had been a long-time Nashua landmark, dating to revolutionary times when it had served as a stage-coach hostelry. Through several ownership changes and one major fire, the Green Ridge served dinners and pies in its restaurant – and not just of turkey, but also seafood; the Green Ridge also served lobster, clams and scallops. Green Ridge Turkey Farm Restaurant, ca. 1960. Image from Card Cow. 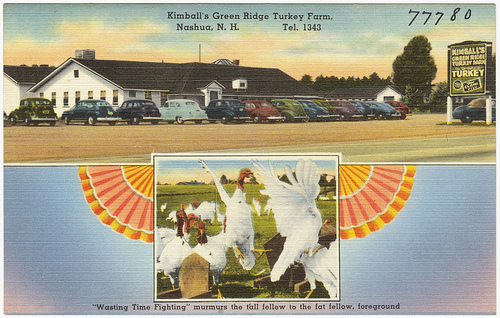 But, of course, Kimball’s Green Ridge Turkey Farm was best known for its turkeys, which were sold either “drawn and ready for the oven” or “cooked and pan roasted”. The Green Ridge also offered its own dressing and gravy. The Green Ridge Turkey Farm got its start when George and Grace Kimball bought the 200-acre property in 1931 and soon after opened a farm stand. Its frontage on the Daniel Webster Highway contributed to the Kimballs’ success, and, by 1938, Mr. and Mrs. Kimball expanded the stand, adding turkey sandwiches and ice cream to its offerings. 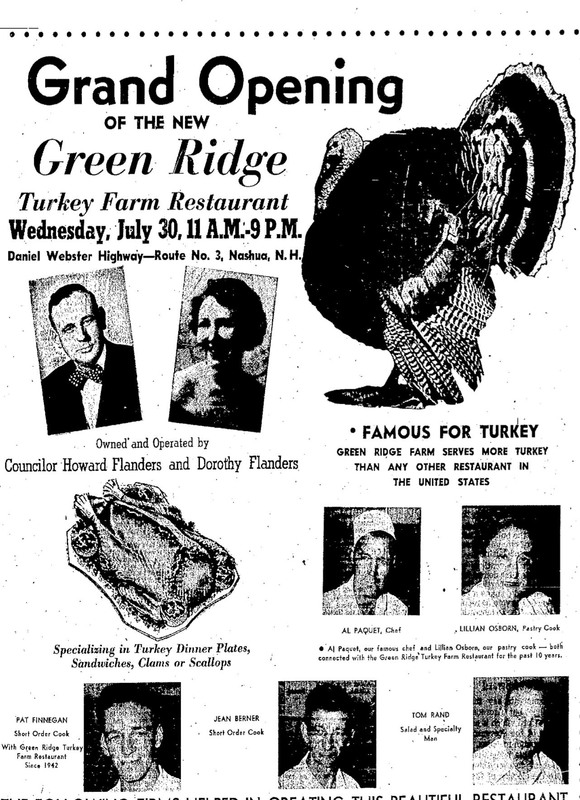 Two years later, in 1940, the Kimballs added the restaurant, and the Green Ridge’s reputation for great turkey, supplied directly from their farm, quickly caught on. The farm quickly grew to accommodate the raising of up to 6,000 turkeys. 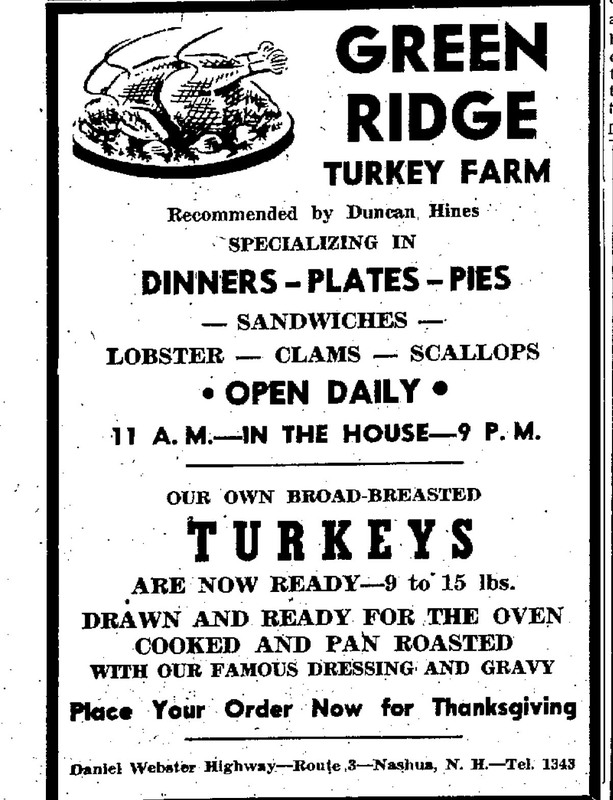 The reputation of the Green Ridge as a restaurant and a turkey farm spread throughout New England during the war years. Then, during one of its best years, just four days after Thanksgiving, disaster struck the Green Ridge. At 6 PM on the evening of November 27, 1950, a few hours after the farm had hosted the New England Turkey Growers’ Association, Dr. Frank Flagg knocked on the door of Mr. and Mrs. Kimball’s home. The Green Ridge, just 100 yards south from where they were sitting, was on fire. Dr. Flagg and the Kimballs set off to alert the fire department, but couldn’t find a working telephone. A recent storm had knocked out phone service in the area. Eventually, others saw the smoke and flames in the sky and the calls began to arrive to the Nashua Fire Department. The first caller told the fire department that the ‘Green Ridge farm building [was] ready to explode’. A moment later, a call from the Wayside Furniture Company told the firefighters that something was wrong at the Green Ridge. The Central and Lake Street stations responded to the fire. All call men were soon summoned to duty. Firefighters arrived to find the fire at its peak and the interior of the building was completely engulfed in flames as the smoke rose skyward. Motorists and nearby residents stopped to watch the fire. A lack of hydrants in the area meant the firefighters had no available water. Firefighters rushed the half-mile south to the Allen property and were able to attach a pump to a water hole. They had finally found water to fight the fire. But, by then, it was out of control. By the time the fire was out, the restaurant was a total loss. George Kimball told reporters he didn’t have adequate insurance coverage to rebuild. The restaurant had been officially closed for the season just a couple of days before, and would have reopened the next year, on February 22. The losses were deep, however, and the costs were formidable to replace the lost large dining room, soda fountain, and two deep freeze units, that had been holding 250 turkeys. The Kimballs put the Green Ridge Turkey Farm on the market. A buyer came forward and, on March 15, 1951, the Kimballs sold their Green Ridge Turkey Farm to Mr. and Mrs. Howard Flanders. The Flanders rebuilt the restaurant, and reopened it in July 1952. The Flanders’ ownership of the Green Ridge was short-lived. After rebuilding and reopening its restaurant following the 1950 fire, they sold it to the Charpentier brothers, Luc, Victor, and Edmund, in 1954. The Charpentier family owned the Green Ridge from 1954 through its closing in the mid-1990’s, when it was closed, razed, and replaced by a Barnes & Noble, which still stands at the site. Still, when driving down the DW Highway in Nashua even today, I still look twice for the turkey that once stood atop the Green Ridge Turkey Farm sign perched near the Spit Brook Road intersection. Has it really been more than 15 years since it came down? Great post! We were just talking about the Turkey Farm last week when we drove by the old location. There are lots of folks who still remember. Remember Green Ridge and miss it. It was the best ever. Thanks Maureen, Martha, and Heather for your memories. Thanks too to the Growing Up in Chelmsford Facebook Group for sharing this with its members. If you’ve got ties to Chelmsford and surrounding towns, please check their group out. My first job was washing dishes at Green Ridge. For lunch you could have anything on the menu expect lobster or stuffed jumbo shrimp. I always got the swordfish stake. Bob, I worked there in the 80’s as a waitress. Do you remember Rita? I think her name was Rita….she was elderly by the time I was employeed there. She was one of the managers I believe. I don’t remember Rita, but I don’t remember anyone outside of the kitchen staff. I’m not sure I ever saw the waitresses. It was strange in that I never made it out of the kitchen. The first time I saw the restaurant was when we moved there in 1963. We stayed at the hotel right next to it until we found a house to rent. So I had eaten there quite a bit around 1963 and years later it ended up being my first job. I worked all summer and bought my first electric guitar with the money I saved. Ha! Great story Bob! I worked there in the late 80’s and remember in the kitchen 2 boys from Brazil. Mello and Juarez……That’s it. I don’t remember any other names…..My brother was a bus boy there and all the waitresses loved him…….I have a picture of me in my uniform and a picture of those boys. I think I will post them on my Greenridge Facebook. Thanks for responding! I have a facebook page of the Greenridge Turkey Farm. I have been hoping that old employees would like the page!!! Great memories! Thanks, Linda, for posting about the Facebook page. This is one of my more popular posts. I bet a lot of people reading this post are former employees of the Greenridge. I was a busboy from 1965 to 1967 with my brother Joe. A lot of great memories I was 16 years old when I started. Its a great memory we discussed on Thanksgiving…. Does anyone know if the original owners were related to the Kimball’s of Westford that started the ice cream stand? Wow, I had no idea Green Ridge Turkey Farm was gone. I was planning a rode trip from R.I. to go there and just found out. How sad! It went through alot of different owners and was finally and sadly enough shutdown in the early 90s. I loved that place! Great good and great times. I lived in Chelmsford from 1990 through 1999. During the early part of my time there, I discovered the Turkey Farm and fell in love with it. No one came to visit me from out West that they weren’t treated to a fine New Englland turkey dinner at the Turkey Farm. I was devastated when they closed in the mid 90’s. I heard they reopened down somewhere near the coast, but I was never able to locate another restaurant by that name. Great loss!! I’m back in California now, with wonderful memories of some of the greatest turkey pot pies on earth, and sad that I will never again be able to enjoy one. I rememeber this place so well as a kid. Even worked there briefly on their wait staff. Been to so many places – And except for my Grandmother’s bird – Nothing comes close ri the turkey from Greenwich. Reading the post brought back such fond memories of my life in Nashua. Thanks. I worked there as a line cook in the 60’s great place to work. see herself continuing to operate the restaurant after his death, so my cousin, Luc Charpentier (son of Edmund who co-owned it with Vic and Ann) took over the ownership and operated it until its closing in the mid 1990’s. During their ownership, my parents were so proud of their success – a cocktail lounge, addition of a large function room and the delicious Friday Night Buffet. I currently have in my home the Spinnet piano that came from the restaurant. Business boomed in the 50’s and 60’s. Many pf the Daniel Webster Highway business owners were so upset with the proposed building of Interstate 93 that would eventually re-route the tourist and ski traffic from Boston to the White Mountains and Lakes Region away from the DW Highway. But they couldn’t foresee that business would continue to be good despite. I still meet people who remember the Green Ridge. How nice to see this article and the posts following it! Sadly, my mother, Anna, passed away this month after a long and active life. I miss them both. Hi Gail – thanks for your comment. Many do remember the Green Ridge. And it’s very clear, reading through the comments, that it’s still remembered and missed. Thanks for sharing! I wish the recipe for making that bread stuffing was posted somewhere. I miss it greatly. Gail, what can you tell me about Vic’s Diner in Somersworth? The Green ridge was a N.H. landmark for many years. Whenever I came home from college and later when I was married the famous Greenridge buffet was always at the top of our list of Nashua things to do. I remember Mr’ Dion who used to own Dion’s Bright spot at lake & elm sts. and later Dunstable rd. used to carve the roast beef. ham and Turkey. He used to serve up 5 cent hot dogs to me when I was at Crowley St. school. A nice man and a wonderful place for families to get together for the evning. Wasn’t there a Greenridge steakhouse next door? The Olde Coach restaurant and lodge was located next door, heading north, for many years. I believe that when The Olde Coach closed, Green Ridge opened the short-lived steak house there. ( I’m digging deep for this memory, so if anyone else has better info, feel free to share!) My aunt was a waitress for many years at Green Ridge, and another aunt was the bookkeeper at The Olde Coach. Pat, You are right about the Olde Coach Inn and Restaurant. next door to Green Ridge. It was there during my parents’ ownership of Green Ridge, in the 1950’s until mid-1960’s. I’m not sure when Olde Coach Inn closed. I don’t know about the Steak House. That was after my time i Nashua. When I was 15 years old in the summer of 1965 at worked at the Olde Coach as a dishwasher then as a salad man making salads. My Brother Joe Upton was working at the Green Ridge next door as a busboy. After about three months I ask the chief for a rase he said no. My brother Joe told me I could make more money as a busboy at the Green Ridge so a quit the Olde Coach and work at the Green Ridge for about three years. Then in 1968, I went across the street to work as a waiter at the 88 Restaurant until 1969. We were just talking about the Green Ridge with somebody we took there in the 90’s when she was about 9 years old. Her younger brother loved the muffins they made and ate so many that he got sick and to this day avoids eating muffins. Sara now lives in New Mexico and often shares this story with her 3 children! Oh my, the memories. I went there as a child in the mid to late 60s. My family settled there in 1736. I lived where the Pheasant Lane Mall is. JC Penny’s front door is where my bedroom used to be. Those memories that feel so good, they hurt…they include Green Ridge…always. Hi Marianne – thanks for your comment! There’s a lot of interest in the Green Ridge, still! This is one of my most popular posts here. I remember the area where the Pheasant Lane is now as an empty field (in the 80s). I remember the drive-in, a shoe store, Shakey’s and the Singapore along DW Highway. I didn’t know there were houses back there. I’d love to do a post on the area before the mall was there. Do you have any photos of what it looked like back there, before the mall? I was a busboy there in the mid 1970s. I remember working with Estelle, Priscilla, Terry, Leslie, and many others. I loved that place. Hi John, thanks for sharing! If you’ve got some scanned photos of the Green Ridge handy, I’d lost to post them here. This post has been popular with a lot of former employees and patrons of the Green Ridge. I recall back in the mid 70’s there was a “club” just beside the Greenridge and we went up to see Herb Reed and the Platters. Definately had class and was a decent place to go while working around the state during that time. Does anyone recall the name of the so-called club? Would sure appreciate this brain teaser! I was walking from my car towards the door of the Bright Spot a few years after Benson’s closed. A car with Connecticut plates stopped and asked for directions to Bensons. I hope they didn’t drive here just for Bensons. Another place to remember. I don’t remember a club there. Think it might have been the Brothers Four? I know the Platters played there. I don’t know why, but for some reason the Green Ridge Turkey Farm popped into my head today after an afternoon nap. My parents would take us on ski trips (wearing jeans not snow pants on skis with runaway straps) and hiking trips in NH and the Green Ridge was a favorite stopping place on the way home to Chelmsford. In my younger years ’68-73 or so, I and my two brothers would be so excited (and famished) to pull up at the Turkey Farm after a long day on the road. Thank you for cataloguing this memory. For many years Route 3 ended in Tyngsboro, MA and at Exit 2 in Nashua. You were diverted to the D.W. Highway which was a direct effort of the merchants along the D.W. Highway in order to maintain traffic flow along the DW Highway and to protect their businesses. OH MY – The memories!!! There used to be a railroad based amusement park down by the river at the end of Spit Brook Road also Law Motor Freight and Grossman’s Lumber across from the Green Ridge. At the southern end of the current Pheasant Lane Mall was a drive-in theater. Anyone remember Hayward Farm on the site of the Nashua Mall on Broad Street at Exit 6??? Haywards is still there, I live close to it.They connected route 3 into Nashua while I was in the service. One day after I came home I was on Route 3 and was getting ready to turn off in Tyngsboro and saw that the road kept going so I followed it into Nashua. My older sister remembers when there were turkeys behind the turkey farm. My folks had a business on Kinsley St. (Route 11) in Nashua.We had a lot of cars stopping and asking directions to Benson’s Animal Farm. I left Lowell for California in 1954 but went back many times over the years, and always tried to get to the Turkey Farm at least once- (had two sisters who lived in Nashua). In addition to turkey, they had a traditional New England clam chowder that NOBODY has on the West Coast. Lobster at Bishop’s in Lawrence and steak at the Hilltop in Saugus were often on the menu. They’re all gone. The Green Ridge Turkey Farm Restaurant was our favorite place to dine ! We lived in south-eastern Mass. near the Rhode Island line ~ leaving home at 10:00 a.m. on a Sunday ( every three or four weeks during the winter when there was nothing else to do ) by way of Route 95 to 128 to Route 3, exiting at the Tyngsboro exit . . . . then up Daniel Webster Highway to the Green Ridge, arriving just before they opened at 11:30 a.m. We usually parked next the big sign, with revolving crowned-turkey on top, and up the ramp to wait on the bench for the door to open. Down the hall, towards the other entrance door, was a glass display case containing a huge white-feathered stuffed turkey with a miniature crown on its head ~ it was their logo ! The Charpentier family, owners-operators, always had a guest book in that long waiting-room hallway, and it was fun, before exiting, to flip the pages and see where visitors were from ! We would always stop in on our way back from trips to Lake Winnipesaukee, but made it a weekend jaunt during all seasons. After eating we stopped by Pheasant Lane Mall when it opened in the 1980s and beyond ~ returning home by way of country roads from Chelmsford to North Attleboro, then Route 152 to home ! We heard about its closing on Boston station Channel 5 ~ we went every weekend after that, for the next four or five weeks it remained open for business. The very last day it was open was on Saturday, December 2nd, 1995 ~ I took a menu as a souvenir ! On one of those last visits I parked across the road, before it opened at 11:30 a.m., and took pictures of the restaurant ~ then drove over and took a close-up of the revolving turkey ! I have that menu displayed in my home and not a day goes by that I don’t think of the Green Ridge and my great memories of the place !